The theme of the workshop was: “Experience internaly adaptable, demountable and reusable solutions for the Circular Retrofit Lab”. 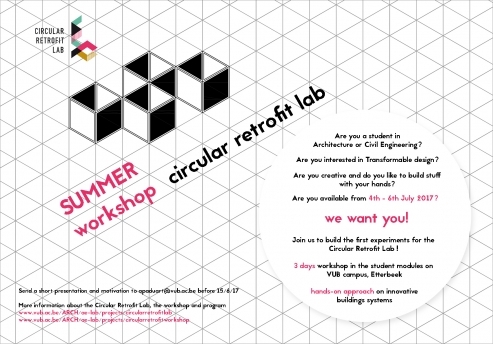 BAMB partner VUB was organising a 3-days Summer Workshop in the context of the ‘Circular Retrofit Lab’, one of the pilots in BAMB. From Tuesday 4th of July until the 6th of July, student design teams experienced with a hands-on approach the challenges involved with the design and assembly of reversible and sustainable solutions. Students were assisted by a technical TRANSFORM team, in order to successfully integrate innovative reversible wall solutions in an existing building context, i.e. the context of the Circular Retrofit Lab. This living lab is situated in 8 existing modules of the student village in the center of the VUB campus of Etterbeek.